Place flour and chicken in a gallon size zipper bag. Shake to coat chicken in flour. Heat olive oil in a large non-stick skillet over medium high heat. Add the chicken to the skillet in batches and cook, stirring occasionally, for 3 to 4 minutes, or until white and no longer pink. 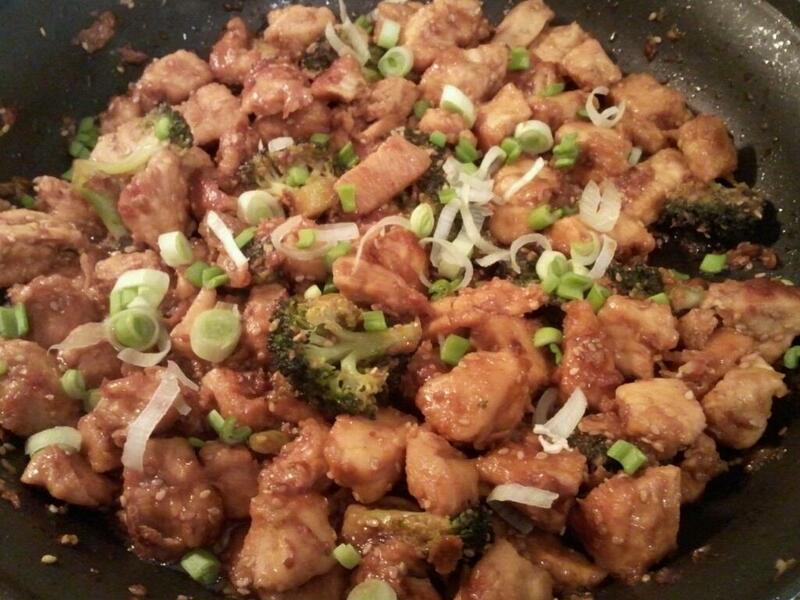 Meanwhile, in a medium-sized skillet, combine the soy sauce and honey in the skillet. Cook, stirring occasionally, until the honey is mixed well with the soy sauce. Stir in the orange juice, grated ginger, sesame oil and sesame seeds. Pour over the chicken in the larger skillet and stir to coat. Add in any chopped veggies you want. For this batch, I used just broccoli. Other times I have used different combinations of broccoli, onion, green, yellow, and red peppers, shredded carrots, bean sprouts, snow peas, water chestnuts, and mushrooms. Cover your skillet and cook until veggies have softened. I tend to leave the veggies a little crispy still because my husband likes them still crispy. After other veggies have softened, add the green onions. Note: You can buy toasted sesame seeds, usually with in the section with other Asian grocery items. If you can’t find them, to toast sesame seeds, place in a dry skillet and toast, shaking the pan, over medium high heat for a minute or so, or until fragrant and lightly browned. Do this first and cook the chicken in the same skillet to pick up more sesame flavor. Also, if you are using a lot of veggies, you may want to double the ingredients for the sauce so there is some for the veggies.